Are you thinking about moving to Atlanta? Maybe, you have accepted a job in the city that is home to nearly half a million people. On the other hand, maybe you just want a change of scenery. Whatever the reason, National Dispatch provides the perfect solution for a fast and easy move to your new home. National Dispatch can handle all your auto transport needs, allowing you to focus on other moving day tasks. We understand that moving can be challenge. This is why we seek to provide auto shipping options, at an affordable rate, that are catered to each individual’s needs. We pride ourselves in providing the best customer service. This way you never have to worry about your car when you are traveling to your new home. We briefly explained why car transport services are the best option when moving. Auto Transport is also useful when purchasing a car out of state, entering an auto show, going on a vacation, and much more. Here are a few reasons why you should use auto shipping services. Car shipping saves you time. If you are moving across the country, driving could take several days. This may require you to take days off work, in order to do so. When you ship your car, you can fly by plane, instead. This allows you to get to your destination, much faster. All the hard work is done for you. Contact the auto shipper to book services. After doing this, you will be told a pickup and delivery date, depending on which service you select. If you are pushed for time, there is a guaranteed shipping option. With door-to-door auto transport, the driver will come directly to your home to pick up the vehicle. Once it is loaded on to the carrier, it will be safely transported to its destination. Car shipping can also save you money, in comparison to the alternative of driving to your destination. When you drive to your destination, you must take into consideration how often you must stop for food, gas, and lodging. You can’t go on a long-distance trip, without taking breaks. All these stops can really add up, in terms of expenses. This is a very important consideration for all car owners. We want our cars to last us as long as possible. More mileage means more car maintenance. If you own a classic car, it is important to keep the mileage down for the value to stay high. This is why many classic car owners only drive their cars on occasion. Auto transport is the perfect solution to save your car mileage and wear and tear. Learn more by reading our 4 Key Benefits Of Auto Transport. When people are in search of a new city to move to, many are interested to find a place with numerous job opportunities, nice weather, and an affordable lifestyle. Atlanta has it all. That is obvious in its population. 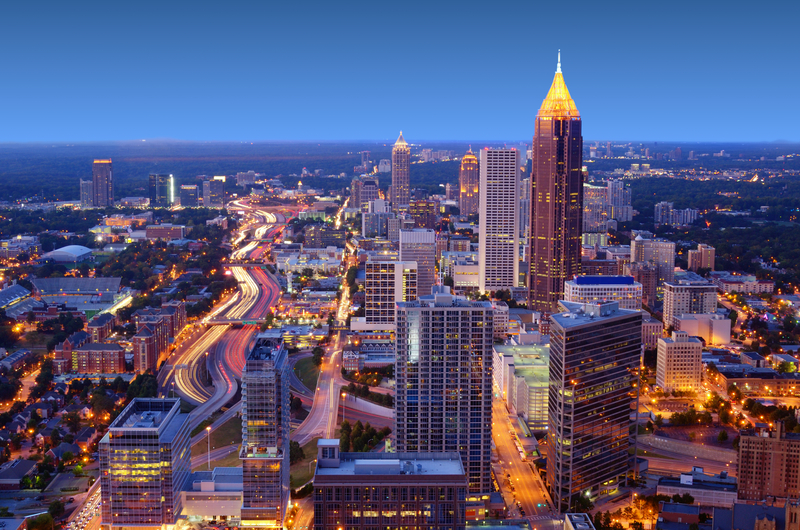 Over 5 million people live in the metropolitan area of Atlanta. Here are a few reasons why Atlanta is so popular. You have to have some way to make a living. Atlanta happens to be one of the top cities for young professionals. Therefore, if you are a recent college graduate, then head to the city to look for a job. The average salary is somewhere around $50,000. There are also numerous Fortune 500 companies headquartered in Atlanta. These companies include Mercedes-Benz, Home Depot, UPS, Aflac, Coca-Cola, Delta Airlines, and more. Atlanta has a relatively low cost of living, in comparison to other large cities. These means that you can rent an apartment or buy a house for less. Home sales are expected to continue to increase, as more and more people move to the area. With great jobs and affordable houses, the city makes a great place to live, work, and raise a family. There is an extensive list of possibilities when it comes to making weekend plans. You can visit the Georgia Aquarium, one of the largest aquariums in the nation and home to thousands of species. Go to the World of Coca-Cola to learn everything there is to know about your favorite soda. Walk through 30 acres of plants, fountains, and sculptures at the Atlanta Botanical Garden. Your options are endless. Learn more by reading Car Shipping Services Georgia. Since not every person is shipping the same car to the same place, car shipping varies depending on many factors. The cost to ship your car will primarily be based on distance, type of car, carrier type, and season. This is the most important factor when considering the cost to ship a car from one location to another. It will cost more to ship a car, coast to coast, than to a few states away. This is because of mileage and fuel costs. The type of car is important for determining how much space it will take up on the transport carrier. It also important in determining how much it will weigh. Larger cars, such as SUVs, will weigh more and require more space, than smaller sedans. There are two types of transport carriers, open and enclosed carriers. Open carriers are the standard option used for transporting a car. However, if you want more protection from road elements and weather, you can pay more for an enclosed carrier. Like most industries, the auto transport industry tends to get busier during certain parts of the year. This is when demand is high. This tends to be during the summer time, when many people are moving to other parts of the country. The best way to determine how much it will cost you to ship your car is by filling out our online quote form. It is free, and you will receive a quote instantly. No personal information is required. You can also call us at 800-321-2051.